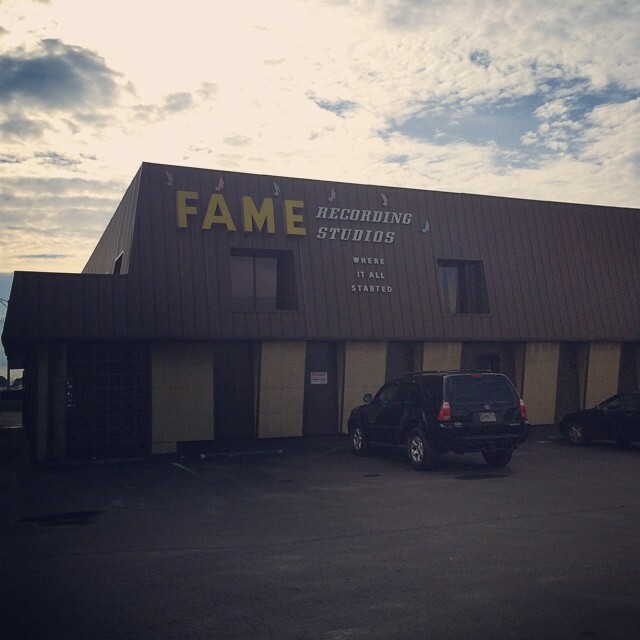 I really just wanted to see FAME studio. And so that's what we did. We accidentally stumbled into it while looking for something else. Sandwiched between a Walgreens and a pizza place, the big yellow letters jumped right out at us. It was a cool moment. We pulled into the pizza place parking lot and stared at it. But all of a sudden it didn't seem as important to me. As soon as it was a real place right in front of me, all of my daydreams about the Rolling Stones and Aretha Franklin just kind of . . . evaporated. It's somebody else's dream. It's the dream and the miraculous business of a man who had nothing as a child. He clawed something out of the mud around him. If you don't know the Muscle Shoals music story, then you should do some reading. You already know the music. It's part of your pop culture. It doesn't matter how young or old you are. You know it. Standing in the parking lot, I found myself homesick for the old man whose grandmother walked the Trail of Tears, but couldn't be satisfied until she heard the "Singing Water" again . . . so she spent years walking home. Listening until she knew she'd found it. It was the same afternoon and I was standing in a meadow full of wild flowers and millions of little things with busy wings . . . and it was quiet. My dream isn't a studio like FAME. But I understand from standing by the creek, in that field of flowers, why that music came from here. Even the spiders' webs are singing about it. But I think I'm singing about something else. Do you ever get that feeling? You came searching for something that you thought you wanted. You really, really wanted it. And you thought it was wise. You thought you saw a connection. Somehow you find yourself in love with a field of flowers nobody warned you about. They grew up just for you. The whole situation strikes you as an unexpected hospitality. It's an open table. Somebody set it with a place for you and you're meant to rest in it. It's like the Eucharist. It means "grateful" and "gratitude." Hellen Keller knew about singing water even though she couldn't hear it. And so she spoke her first word. "Water." She spelled it into the palm of another person's hand. Into the palm of another person's hand. Later in her life she would talk about her teacher "learning about" her so that a light could shine into her mind. 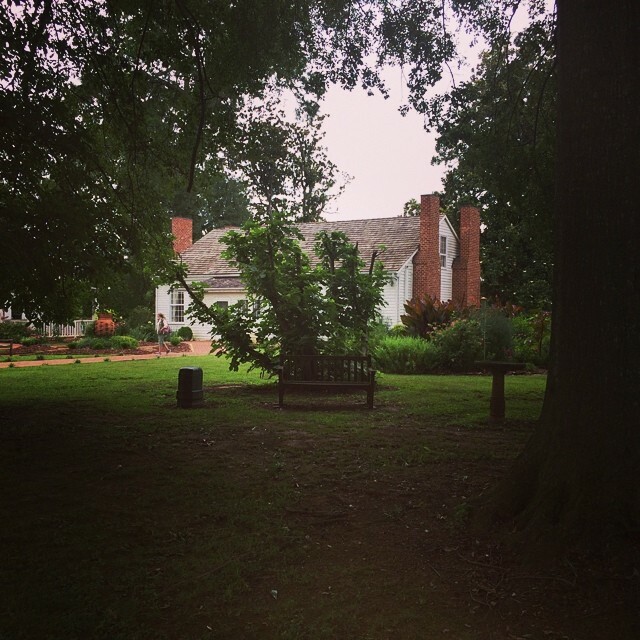 This afternoon I stood in the yard of the Ivy Green house in Tuscumbia, Alabama and cried because I've wasted some of this precious time searching for gifts in the wrong places. I can tell you right now what I needed: I needed to see that it matters for me to put the writing on the back burner again and again for my kids . . . to go into the classroom every morning prepared to learn more about them than they will learn about music. It's what I needed more than seeing the place where music made history. I just needed to know that I was still walking toward the calling. Sometimes I get lost. We can't expect to be enamored with the same things other people are. It looks so good to us from the outside - "their life" and "their success," but there is no comparison. I'm a singer/songwriter who would rather give away her CD's for free to sweet strangers than book shows. And I'd rather sing with kids than famous people. I don't understand how it all goes together yet. I really don't get it. But I know what the Eucharist table looks like when I find it in the world. And here it was. Ivy Green. Flowers. Cold Water. I know what the singing water sounds like. Peace. I don't know what your Peace is. I don't know what your need is. But I know that there is a table for you somewhere. The place is set. And you can find it. Nobody is hiding it from you. Life and Light . . . Embrace the open table wherever you find it.